I am a bit of a whiskey lightweight. I admit that in my younger days I drank my share (and probably some of yours) of whiskey sours, and yes, I did the horrible girly bit of mixing Jack Daniel's with root beer or Dr. Pepper (*facepalm*). I know that the true whiskey fans out there are reading this in horror, and I hang my head in shame. Nowadays, while I still like the smell of whiskey (or Scotch), it is just a little too strong for me to drink. I dunno what happened to me. I like the idea of this bar because it's a whiskey filled truffle surrounded by milk chocolate. As I've observed in a review of Weinrich's Marc de Champagne bar, I would again like to point out how beautifully molded these bars are. 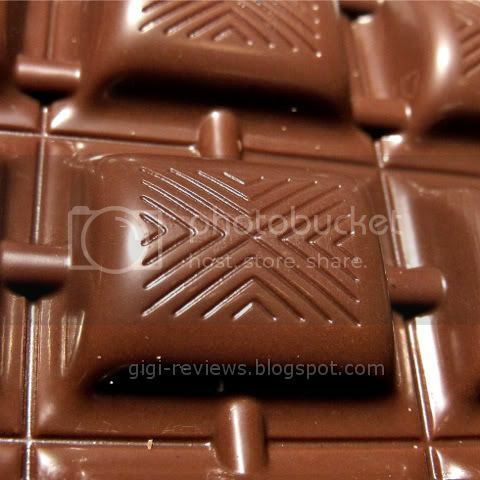 The chocolate is glossy and it made me think of an edible Art Deco tile. You can really smell the whiskey in this bar -- even before you break a piece off. It's a woodsy, nutty, boozy scent, in all the best meanings of the words. One of the bar's big selling points for me is that the filling is indeed a truffle-type consistency, rather than being filled with a syrupy liquid. 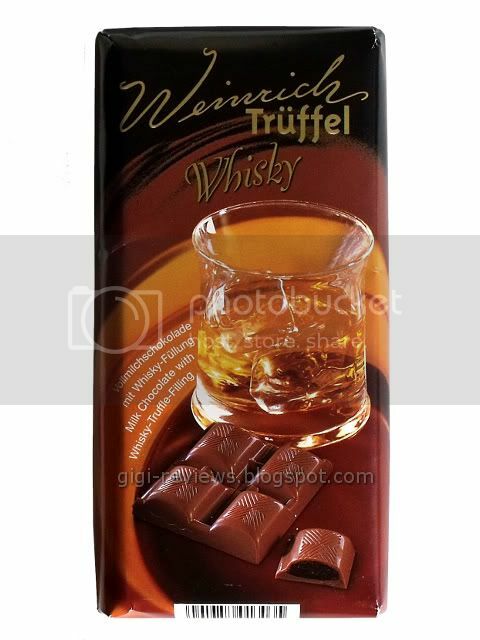 I am a big fan of alcohol-flavored chocolates. I just tend to not enjoy versions that are liquid-filled, because they often taste only like some half-assed version of whatever it is supposed to be -- or worse, they have that fake Star Trek "synthahol" flavoring that makes them taste more like edible lighter fluid. The filling in this bar avoids all of those pitfalls. 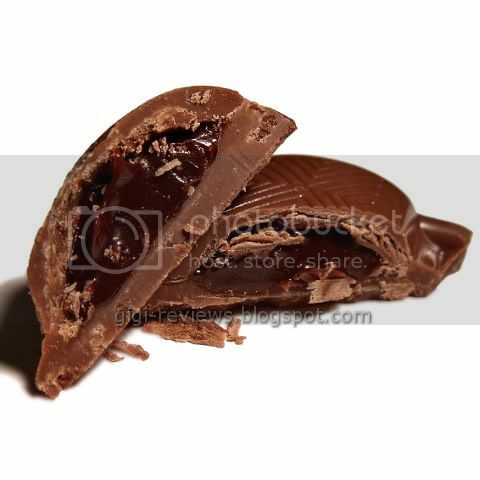 The Weinrich filling has a very rich, almost ganache texture. It's super smooth on the tongue and is a deep glossy brown. The flavor is all classic whiskey. You can almost imagine that you are in a mahogany-panelled salon with stodgy old men in huge leather wing chairs, puffing on cigars while sipping single malts and complaining about what doofuses their daughters ended up marrying. The flavor of the whiskey is strong -- but what keeps it from being too much, even for a whiskey wimp like me, is the chocolate. 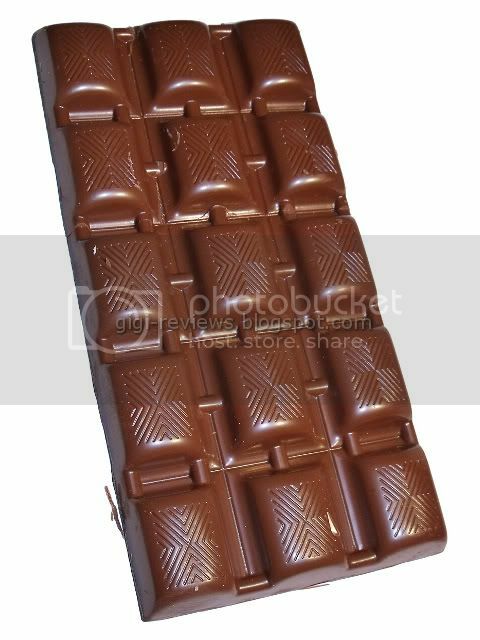 The milk chocolate is sweet and has strong milky notes to it. It melts with a little grain that goes great with the smoothness of the filling (on its own, it would be on the throat-burning side). There's not a lot of snap, but the melt is fast. I really liked this bar! I'll leave the actual Laphroaig to Chris (it's one of his favorite Scotches), but this bar made me very, very happy. May contain traces of wheat and nuts. Contains real whiskey. Their Truffel range is very, very nice. They also have rum, egg liqueur, brandy, orange liqueur chocolates. They're among the chocolates I wouldn't refuse after trying once.